The 2 day Plastering Course teaches the essential techniques for successful plastering. The aim is to equip you with the knowledge and ability to plaster a wall, on your own to a good standard. Learn the techniques of both backing coat & finish (skim) coat application, giving the ability to plaster brick, block, stone or plasterboard walls. The course is suitable for: both men & women, home owners, builders, beginners and improvers. No previous plastering experience is needed; being a personalised course means that we can start right at the beginning, or from a point that you want to improve your skills from. 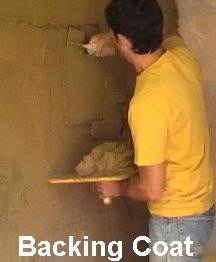 The Course teaches the essential techniques for successful plastering. The aim is to equip you with the knowledge and ability to skim a wall, on your own to a good standard. The techniques needed to achieve a flat backing coat and a smooth finish coat. Understanding just how important it is to apply the right pressure whilst maintaining the correct angle of your trowel. How to practice at home, and achieve good results in the process. The course format as below, is ideal if a general plastering ability is required. If specific training is required - so as to ensure success with one particular aspect of plastering, let me know when you're booking (add a note in objectives box, or email me). I keep a range of materials and have a few different wall surfaces so if you're unsure we can always change the format as we go along. 1:00 Patching and forming external corners. All plastering courses are 100% practical. Tuition is given through a series of demonstrations and then instruction whilst you are plastering a wall. More practice time to consolidate what you have learnt. Extra time to plaster two more walls and refine your new found skill. Learn how to form external corners and obtain seamless joints to patches. The option of learning how to plaster a ceiling. £100 deposit is payable now. The remaining balance of £450 is payable on the day of your course. Alternatively you can make payment in full. Apologies for the lack of availability, but due to the increased demand of on-site training this course is not currently available. 1) My motivation is to to learn to be able to plaster my basement (currently bare concrete blocks). Will I learn to do this? 2) Does the course cover the use of plasterboard, or is that not necessary once you can plaster directly onto a rough surface? Yes, the course is perfect this - it will allow you to plaster your basement. Day 1 you will applying a backing coat directly onto bare bricks/blocks with a backing coat, to be finished the next day with a skim finish coat. As the course is 1:1 we can cover anything you want - whilst I explain all about plastering and the use of plasterboard, the practical elements do not involve using plasterboard. This is due to the fact that it is easier to skim plasterboard than other surfaces due to less variables - it allows for a more consistent process. However, learning to skim a base coat or a previously plastered surface, on the course, provides many more variables and therefore presents far more problems, which equips you with the knowledge and skills to skim any surface,including plasterboard in the future. When you can plaster directly onto a rough surface - there is less reliance on plasterboard, but it is an important material for timber framing and new construction work. If in the future you intend to just be skimming plasterboard then the course can just be geared to enable that to happen as successfully as possible. If a general plastering ability is required the standard course format will be best. I do always have plasterboard to hand so the course content can be decided as we go along - you can just decide on the day. It is only if you have very specific requirements I may need notice to prepare. This personalised course is easy to get to by car or train. 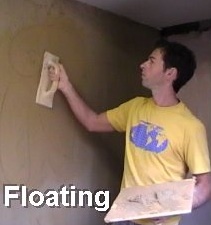 Learn to Plaster in a relaxed & friendly environment. Go on this course and you will receive 100% attention from an excellent plasterer and coach for 100% of the time. how to ensure the backing coat / render coat will properly adhere to any wall surface. the best materials to use. obtaining a totally flat surface on any wall surface.